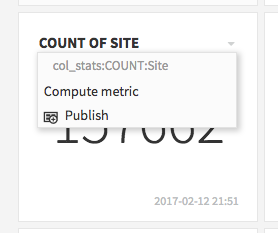 The metric insight allows you to publish a metric about any supported object (dataset, saved model or managed folder). Click on the + button to add tiles. Select metric, then select the data source for which you want to display a metric. If you only have dashboard access, you will only see the datasets, models and folders that have previously been dashboard-authorized. Choose the metric to display. You can only add metrics which have already been computed. The current value of the metric as a large display (either a number, a histogram or a list of values). The full-size view of the insight always displays the history value of the metric. No edition is possible on the metric insight.